Out of ideas for a delicious, quick and easy vegan meal? Making vegan pasta can be difficult, but not anymore. You can make your own pasta using courgette (or zucchini). It’s not only good, but it’s a great substitute for carbs as well. Are you going to try it? How to prepare in only a few steps? First preheat your oven to 180 °C. 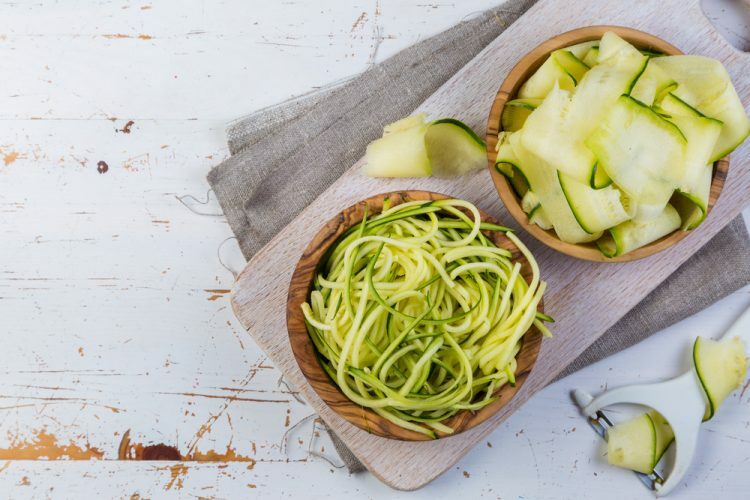 Then use a spiralizing tool to spiralize your courgette. In the meantime make sure to cook your quinoa (12 minutes), drain and set aside. Grind the sunflower seeds in a processor and set them aside in a bowl. Drain your lentils and add them to the ground up sunflower seeds. Add your cooked quinoa, the herbs, garlic powder, half of the basil and flavour it all with salt and pepper. Use your hands to knead the ingredients together and make ‘meatballs’. Decide whether you want to make a few larger ones or more small ‘meatballs’. Put them on a baking sheet and bake them in the oven for about 10 minutes. Make sure their nice and crispy – don’t forget to turn them a few times in the oven so they don’t burn. While your homemade ‘meatballs’ are baking in the oven, it’s time to make your tomato sauce. Use your sieved tomatoes and cook them in a pan with the rest of the fresh basil and herbs. Use salt and pepper to add flavour. You can now serve your delicious courgette pasta and ‘meatballs’. Enjoy!